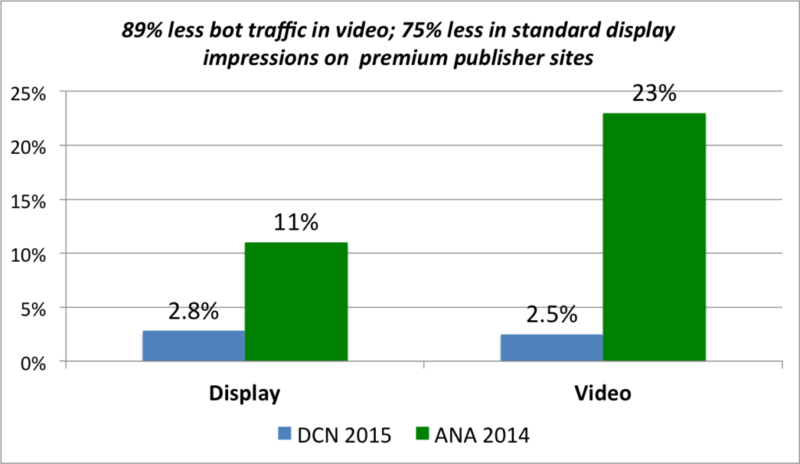 The 2015 DCN Bot Benchmark Report: What Makes a Publisher Premium, conducted with digital advertising security company White Ops, examines bots in advertising traffic across 32 DCN premium publisher sites. This 32 page groundbreaking Report offers insights into ways in which the industry can contribute to solutions. Areas covered in the Report include display inventory, video inventory, viewability, traffic sourcing and retargeting, audience development and content policies, bot sources, malware, impact of current events, usage patterns, false positives and much more. The study examined more than 30 billion total impressions. DCN publishers see significantly less bot traffic overall (3 percent) compared to other advertising campaigns deployed across a wide variety of websites. (11 percent). The average bot percentage for DCN participating sites was 2.8 percent. Display inventory was one quarter of the level rate found in the ANA The Bot Baseline 2014 study. Video inventory was one tenth of the bot rate found in the ANA The Bot Baseline 2014 study.